The video, which premiered on NPR Monday morning, features bandmember Georgia Hubley as the main suspect for a series of destructive crimes, leaving cities in shambles. The video begins as a blissful, sunny day before a man running to his girlfriend explodes before her eyes, splattering his blood all over her as she stands screaming in horror. As a crowd forms from the chaos, multiple people around her continue exploding, simply leaving behind puddles of blood. Hubley remains calm and collected, despite the chaos. 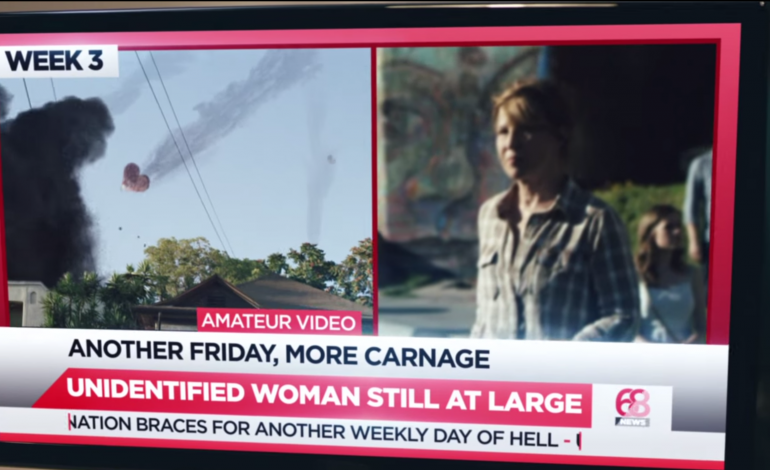 The scene transitions to a news screen, detailing an “unidentified woman still at large.” As the news screens fade, the viewer discovers that fiery, human heart-shaped meteors are the cause of all the destruction. The survivors learn to accept their fate: experiencing a world without Fridays. Yo La Tengo plans to release, Stuff Like That There, the band’s latest album in the works on August 28th. It will honor the band’s 30th anniversary. Watch the video for Yo La Tengo’s take on “Friday, I’m In Love” below.